With new renovations completed over the winter break, the UK Mathskeller is ready to unveil those and other features at an open house from 3-4:30 p.m. Wednesday, March 4, (rescheduled from Feb. 18) hosted by the Department of Mathematics and College of Arts and Sciences. 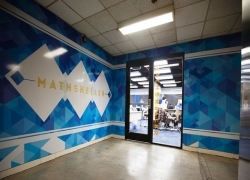 The UK community is invited to visit the Mathskeller, Room 63 in the basement of the White Hall Classroom Building, to celebrate the facility's enhancements, learn about its services and enjoy refreshments. "In the past there was a substantial printing budget so that students could print out their assignments, work on them away from the computers, and then use their access to the computer to enter their answers," said Paul Eakin, professor of mathematics and Mathskeller director. 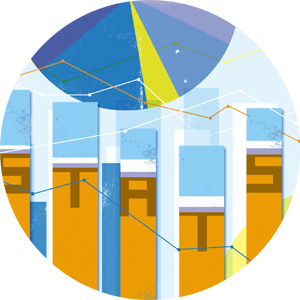 "Today’s students use their laptops, tablets and phones to access their assignments and interact with the math homework systems." "It's a more welcoming environment. There's a lot of resources, like chalkboard space, and it's more open…easier to walk around and help," said Lucas Shelton, a senior chemical engineering student and undergraduate assistant at the Mathskeller for four years. More than 6,000 students utilized the Mathskeller in the fall 2014 semester, and nearly 3,000 tutoring hours were provided by either graduate teaching assistants or undergraduate assistants. Shelton said he has already seen an increase in students using the center since its remodel and expects to see more as the semester progresses. Over the course of 20 week days, from Jan. 23-Feb. 25, the Mathskeller recorded 1,496 visits to the center. Originally funded by the National Science Foundation, UK Office of the Vice President for Information Systems (now the Office of the Senior Vice Provost for Academic Planning, Analytics and Technologies) and external grants, the notion of the Mathskeller grew out of work done by the UK mathematics department in the 1980s and 1990s to understand the proper place for computer technology in teaching mathematics. Now that web homework programs such as www.mathclass.org and WeBWorK have been established as essential tools for learning mathematics, the center has become a common space for students to work together, ask for help when they stumble upon a difficult problem and meet with faculty, teaching assistants and undergraduate assistants. Some instructors actually schedule the majority of their office hours in the Mathskeller because "their own students are more likely to take advantage of these and when they don’t, the time is productively spent assisting other students and supporting the Mathskeller student assistants," Eakin said. The Mathskeller is open from 9 a.m. to 5 p.m., Monday through Friday with no appointment necessary. To view more photos of the new Mathskeller and its construction, visit the College of Arts and Sciences' photo album at https://www.flickr.com/photos/ukartsci/sets/72157648473335303/.